In a large saucepan, combine meats with just enough water to cover. Add thyme, and boil gently, uncovered, for 1 1/2 hours. Do not boil dry. Add beans and simmer for 15 minutes. While beans are heating, sauté onion and garlic in olive oil in a skillet until soft. Add onion, garlic, Sazón and paprika to mixture and stir in the meat pot; simmer, uncovered, for 2-3 minutes. Serve beans on a plate, garnished with meats. 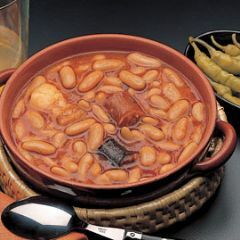 Especially if you have a Asturian Fabada recipe.